Simply put, PIA is a bloated organisation where redundant employees enjoy salaries and perks, act without fear, as they can at a moment’s notice hold the country hostage with the threat of a strike. Having already confirmed with Pakistan International Airline (PIA) my return flight to Karachi a few days earlier, I was feeling relaxed on the penultimate day of my lovely vacation in Nepal, but when I called the Pakistani national airline’s office in Kathmandu to re-confirm my flight, I received a surprise. According to the PIA representative, my flight had been cancelled days ago, and I was to wait another four days to fly to Karachi. As much as I was fascinated by Nepal, I didn’t wish to spend more time in the country. For one, I was running low on cash as none of the ATMs in the nation were accepting my Master debit cards. For the other, I couldn’t afford to miss the extra working days. Feeling restless, I decided to speak with them face-to-face. Upon entering the PIA office in Kathmandu I was met with the distinct flavour of home. It was a taste of arrogance that contrasted sharply with the humbleness of the people of Nepal. The Pakistanis inside the PIA office were both rude and self-righteous, as if the airliner that employed them was their private enterprise, and as if they were doing their customers a favour by serving them. When I asked why I hadn’t been informed about the change in schedule, I was told my cell-phone hadn’t been responding. “Well, it’s off because I am here. I also provided my email address and a relative’s phone number in Karachi. You also had my spouse’s number. Why didn’t anyone try the alternate forms of communication?” I protested. The officials merely responded with unapologetic shrugs instead of offers of compensation in the way of accommodation. Although I managed to enjoy the extra days of vacation, the situation left a bad taste in my mouth. Sadly, this wasn’t a rare case of poor service from PIA. A year or so ago, on a flight from Karachi to Lahore, our plane had been delayed for nearly two hours on the runway. The passengers had long started to lose their patience. The elderly were upset and feeling sick, while the younger travellers were walking around agitated. To anyone who would complain, the officials claimed that the aircraft was grounded because it was being repaired. As it turned out, a malfunctioning PIA plane in Lahore needed a part, and our flight had been tasked with transporting this machinery at the last minute. The delay occurred because the part hadn’t arrived to the airport yet. The passengers were rightly infuriated when they finally learned of this. Nothing, other than water and evasive answers were offered to the passengers stuck inside the plane. On another flight between Karachi and Lahore, we were once again delayed on the runway. This time the adjournment only lasted an hour, but felt worse because the air-conditioning in one half of the standstill plane wasn’t operational due to an issue on the ground. To make matters worse, the atmosphere inside the aircraft worsened thanks to a passenger’s misadventure in the toilet. As a result of these events, an elderly passenger nearly passed out. February of 2012: PIA reportedly carried two passengers on toilet seats because it had sold more tickets than it had space. 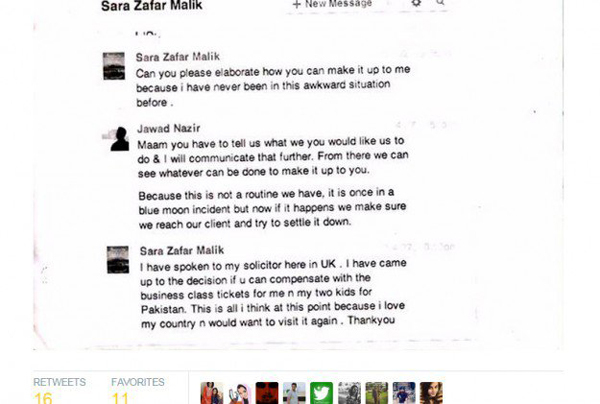 April 2013: In an extraordinary display of stupidity and pig-headedness, PIA began a character assassination campaign against a customer named Sara Zafar Malik, who along with her two children and husband, could have been left seriously ill had she consumed a fungus-ridden bun served to her by PIA. After Malik uploaded a picture of the food to her Facebook page, the image went viral, leaving PIA red-faced. Here, the airliner contacted the woman asking her if they could compensate her in anyway. When she suggested they give her family free air tickets, the company shared images of their private conversation across their official social media pages in order to malign her character. Imagine that. They asked her how they could compensate her. When she suggested a reasonable option, they used the opportunity to make her seem like a criminal instead of apologising for nearly killing her with food poisoning. This was a classic example of PIA’s mind-set. November 2013: A drunken PIA pilot was arrested in the UK after ‘staggering’ around with enough alcohol in his body to intoxicate an elephant. Fifty five-year-old Captain Irfan Faiz was at four times the drink-fly limit. An initial breath test showed he had 41 micrograms of alcohol in 100 millilitres of breath. The limit for driving is 35 and for flying is nine. A later test at the police station showed his alcohol level was 28 – still more than three times the limit. 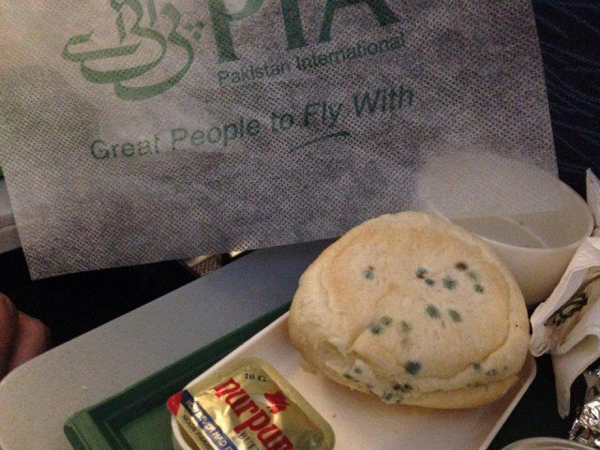 December 2013: A PIA pilot delayed a flight from Pakistan to New York by nearly two hours, merely over a sandwich. Imagine the audacity of this employee, to put his needs so far ahead of paying customers, many of whom missed connecting flights. “When the pilot requested sandwiches the catering staff told him that they were not part of the approved menu, and that the only way to obtain sandwiches would be to place an order with a five-star city hotel – which would take over two hours. The captain insisted that he needed sandwiches and the catering department contacted the Pakistan International Airlines head office in Karachi to seek further advice on the matter. Amazingly, management directed the catering team to order the sandwiches as requested. September 2014: A PIA flight scheduled to fly from Karachi to Islamabad was delayed by two and a half hours because the crew decided to keep hundreds of paying customers waiting for one politician. Later, when Rehman Malik finally showed up, he was disgraced by passengers in dramatic footage captured on a cell phone video that went viral. June 2015: PIA fired five cabin crew members for money laundering after they had been detained in the UK. September 2015: A PIA employee was arrested in the UK while attempting to smuggle cell phones out of the country. November 2015: A PIA employee was arrested in Karachi, trying to smuggle in cell phones and liquor. November 2015: 3KG of heroin were recovered from a PIA flight to Dubai; a small fortune. December 2015: An inquiry was launched by PIA after a pilot had broken rules by entertaining journalist Reham Khan’s request to sit in the cockpit. “‘Although it appears a courtesy on the part of the pilot, the PIA cannot ignore the rules’, Gilani said, adding that under the law unauthorised persons were not allowed to enter the cockpit. December 21, 2015: PIA was fined by Dubai immigration authorities for allowing a female passenger to fly on her son’s passport in an extraordinary security lapse. In an age where terrorists use air travel to spread their agenda, this was inexcusable. 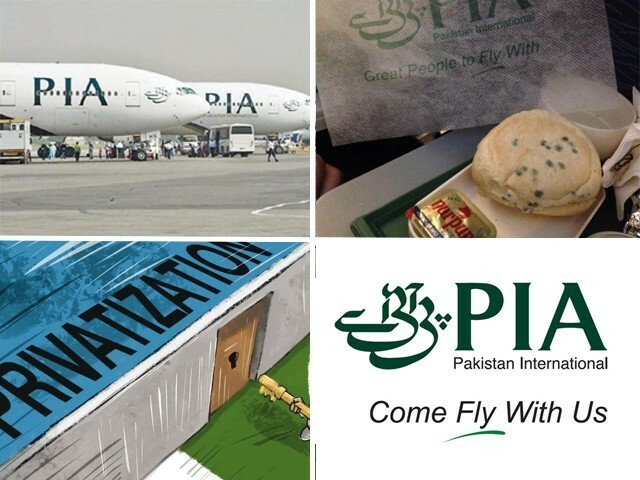 Sadly, these are only a glimpse of PIA’s problems. On any given day, flights are cancelled due to mismanagement, or pilots who treat their employers with disdain. “PIA Workers CBA Union chief, Shamim Akmal, said the management had been too apologetic towards the pilots and had been giving in to most of their demands. Simply put, PIA is a bloated organisation where redundant employees enjoy salaries and perks, act without fear, as they can at a moment’s notice hold the country hostage with the threat of a strike. Any word of streamlining the company into a well-oiled business results in throws of tantrum by PIA employees. The natural step is to privatise PIA so it can transform into a competitive service that doesn’t abuse its customers. The last time rumours of privatisation spread, PIA employees resorted to their typical mafia like tactics by staging sit-ins and preventing higher-ups from entering their offices. Unfortunately, no company will buy a fat cow like PIA for the horse race of air travel business, unless it is allowed to trim the fat. 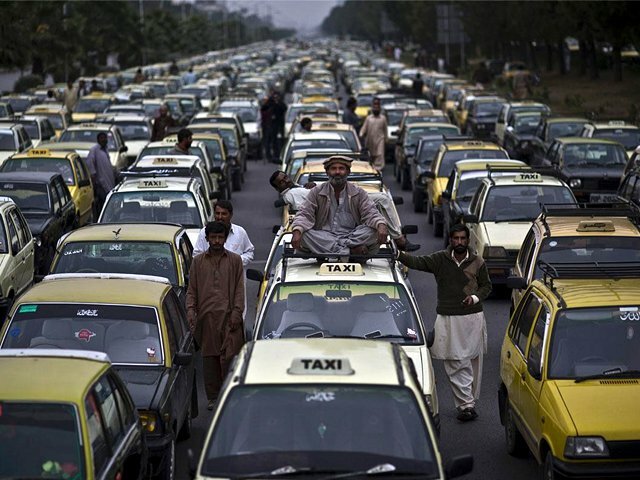 With fuel prices having fallen dramatically, and expected to remain low for the next few years, the time is ripe for PIA to follow the wonderful success story of Karachi Electric Supply Company (KESC)’s privatisation. Of course, this can only happen if the government develops resolve in the face of blackmailing PIA employees. Until then, the name ‘PIA’ will continue to stand for ‘Please Inform Allah’. Sir let alone PIA, I was travelling with shaheen the last week, from Karachi to Islamabad. I was scheduled to fly at 7pm on friday, upon reaching the airport I found out that the plane has been delayed and will now fly at 1am. After fighting for half an hour, they changed my flight to 7.30am on saturday. I left my home at 5.30am after confirming from their helpline that the flight was on time. When I reached the airport I found out that the flight was delayed again and will now fly at 10am. Eventually the plane flew at 11.30pm! Finally some solid perspective on this situation. Appreciate your hard work in getting the “evidence based facts” out in the open. Look at the current success stories of PTCL and KElectric. High speed dsl would have ever come to Pakistan hadn’t PTCL not been privatized. There is “NO” load shedding in Karachi in areas where bills are paid on time. None. Just imagine if our mobile companies were government-owned. The mobile growth would have been zero. 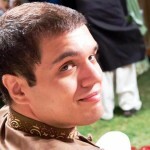 Think about “sakari mulazims” being hired by mobilink, ufone, and zong. Your brain will burst with disgust. Merit can only come about in private organizations. A private owner is only looking for talent. He is not in the business of charity.